This is the forum for the Shadow Wolf clan. » Do you know this? Hola. We are getting prepared! Prepared for WHAT, you ask? First, and probably the most important is Hurricane Fae. She's plowing through the Florida Keys right now and by this time time tomorrow (give or take) she will be right on top of us. Specifically directly on top of my apartment. This is revenge for not putting her in the game yet. 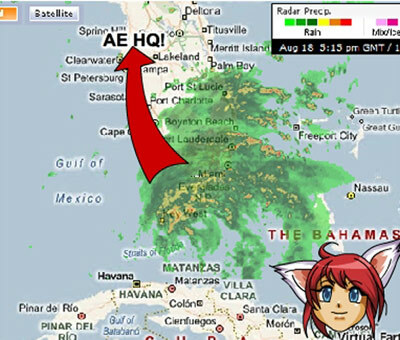 Due to it's secret underground nature (and the fact that it's a bit more inland) Artix Entertainment HQ should be right-as-rain (pun intended), but I expect to wake up tomorrow and find the 85 MPH gusts to have firmly placed a whole tree squarely in the middle of my livingroom. It will be resting comfortably on my brand new couch watching the episode of Kyle XY that I most recently downloaded form the Xbox Marketplace. I might offer it some homemade bread (Dante Q. Breadly III) like a good host. We are also preparing for DragonCon which starts next week. We are trying to prepare 2 weeks worth of releases for you, so even though we will be at Con, we will still be working. We might even launch the relese from our hotel rooms or maybe even one of our panels. Last but FAR from least, we are preparing for a new Beta test of AQ WORLDS. We will be waking Sir Ver up around 3 PM Server Time (EST, or GMT - 04:00) give or take. Artix will be there, so will Zhoom, Rolith, Geopetal and I. So will a number of other of the game devs and forums mods and AKs! If you have a DA you should come see who you can find and tell us how awesome we are! We will need the ego boost if Ser Vir crashes. Remember, you need a Dragom Amulet in DF (or you need to be a Guardian in AQ or a Star Captain in MQ) in order to help us test our baby MMO. If you miss out on this test, make sure you are prepared to join us in the next one! You're going to want to tell your grandkids's grandkid's grandkids (MAN, you're going to live a long time!) that You Were There When It All Started!